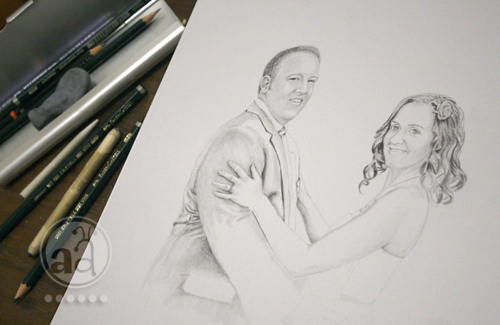 besides doing yard work (before the big rain comes, they say tropical storm "lee" is going to bring lots of rain and thunder) and cleaning up the house for when my sister comes with her family, i've been working on a custom portrait this weekend, the one i showed the beginnings of a few days ago. i really want to finalize it this week, i'll make this project a priority now. 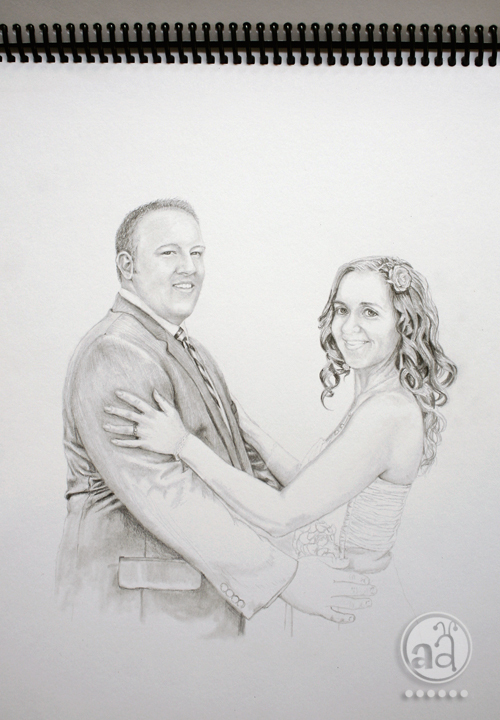 the couple that i am drawing are coming back from their anniversary trip soon and my goal is to get the portrait done by then. as you can see there are still a few things to be finished, including her face which is quite vital to the portrait... :) i fiddled with a lot of details yesterday, so you can't see too much of a difference at first glance. alright, i'll go help my husband in the kitchen now, he's making a stew in the slow cooker. and then i'll see how far i can get with the portrait today. do you have any plans for the weekend, especially you in the u.s. who will have monday off? It is beautiful, great work! It will be a real treasure for them. looks awesome! our plans: work on monday. then it's packing packing packing, cleaning the house - and off we are! They'll be delighted to get such a precious gift. Great work. my labor day weekend plans is to stay under a mess of quilts and get some much needed sleep! Simona, das wird mal wieder so toll!!! What a gift your drawing is and I'm sure this will be a piece that delights, inspires and warms the hearts of all who know this lovely couple.